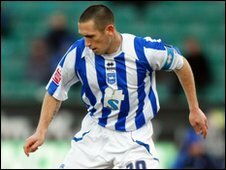 Newly-promoted League One champions Norwich City have signed midfielder Andrew Crofts from Brighton. The 13-times capped, 26-year-old Welsh international has signed a three-year contract in becoming Canaries boss Paul Lambert's first summer signing. "It's a great club with a great history and a great fanbase," Kent-born Crofts told BBC Radio Norfolk. "The atmosphere's always brilliant here. I'm coming into a team that's won the league. I can't wait to get going." Norwich manager Lambert hopes that Crofts' arrival will help create competition for midfield places in the Championship next season. "It's the same as with the rest of the lads," Lambert told BBC Radio Norfolk. "You're there to fight and get in the side. "We're going up another level and he will give me everything he's got, which is all I look for in a footballer, and he'll be hungry to do well.". Crofts started his career with his home town club Gillingham, making 191 appearances, latterly as skipper. But a fall-out with the club led to him being stripped of the captaincy after a returning from international duty. And he then went on loan, first at Peterborough, then Wrexham before joining Brighton in June 2009. He was a regular for the Seagulls last season, hitting seven goals from midfield.